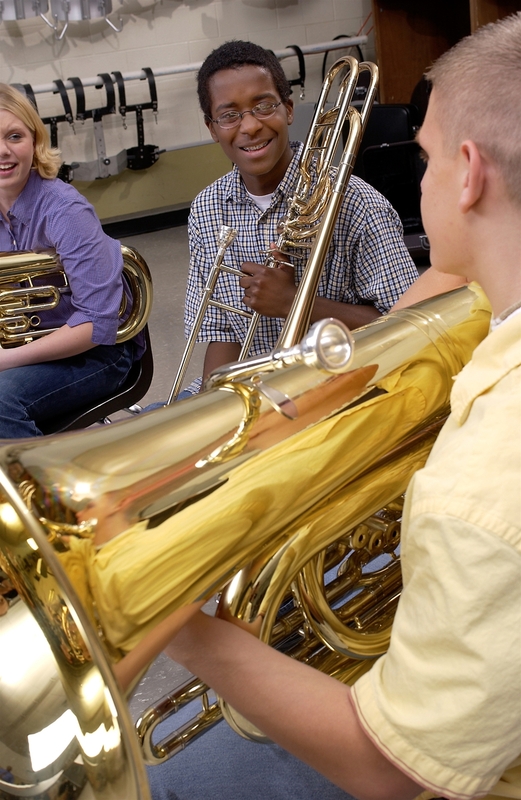 Almost all students like music, are attracted to musical instruments, and would enjoy making music with their friends. Most will join the band if you convince them they could play. In this session you’ll use the musical aptitude test and a simple instrument demonstration to show them they could be successful band members. Meet with all students in the beginning band grade, preferably in groups of 80 or less. Students should bring a pencil — all other materials are provided. Display the instruments on the table at the front of the room and check the audio equipment beforehand. • They don’t need to know how to play an instrument already. • Everyone learns together and it’s not difficult. • If they listen and follow instructions, they can succeed in band. • In band everyone is important and anyone can be amazing. • Band is fun — exciting music, good friends, band trips, experiences. • They can be in band and other activities such as athletics and cheerleading. • This is the only time to join the band; there is no beginner band class in later grades. Convey that you’re a likable teacher and that being in the band is fun and exciting. Keep the discussion general and high energy, avoiding getting bogged down in details for now. Explain that in a few minutes you’re going to see if some students can play the instruments, but first they’re going to take a musical aptitude survey. While you’re passing out the survey forms, tell them it’s not a test but rather an aid to show which instrument they would be best on. Then start the survey. The Amro Survey takes approximately 20 minutes. When the survey is over, have them keep the forms on their desks. At the end of the session they’ll indicate on their forms their interest in joining band. Select 6-8 students who followed directions well on the survey and invite them to the front of the room. Tell them you’re going to see how well they can follow your directions and whether they can make the sound on the instrument. Show the group how to buzz their lips. Then, one-at-a-time, quickly help each student make a sound on the brass mouthpiece that’s suitable for his/her physical characteristics. Finally, put the mouthpieces on the instruments and let them hold them and make instrument sounds. As each student makes the first sounds and the other students see they could do it too, excitement will build and reverberate through the room. 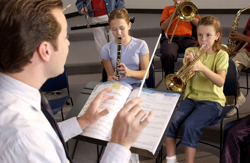 If enough time remains, select another group of 6-8 students and repeat the process with woodwind instruments. At the end of the session reiterate their opportunity to join band and ask them to mark their interest on the survey forms and pass them forward.